Create a design and simulate using EE-Sim® tools: The MAX133 and MAX134 are integrating A/D converters for 3¾ digit multimeters and data acquisition systems such as data loggers and weigh scales. The A/D's internal resolution is ±40,000 counts. An extra digit is supplied as a guard digit to allow autozero or tare of a 4000 count displayed reading to 1/10 of a displayed count. The conversion time is 50ms. 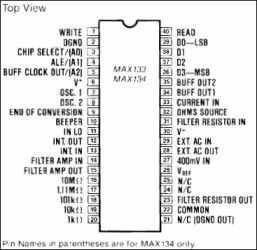 The MAX133 and MAX134 differ only in their microprocessor interface. The MAX133 has a 4 bit multiplexed address/data bus while the MAX134 has 3 separate address lines and a 4 bit bidirectional data bus. Both devices can be used with 4, 8, and 16 bit microprocessors. When controlled by a microprocessor, the MAX133 and MAX134 can perform auto-ranging measurements from ±400.0mV to ±4000V full scale. External attenuator resistors are required, but range switching is performed by the A/D. The power supply is typically a 9V battery or ±5V. Operating current is typically 100µA while standby current is only 25µA.